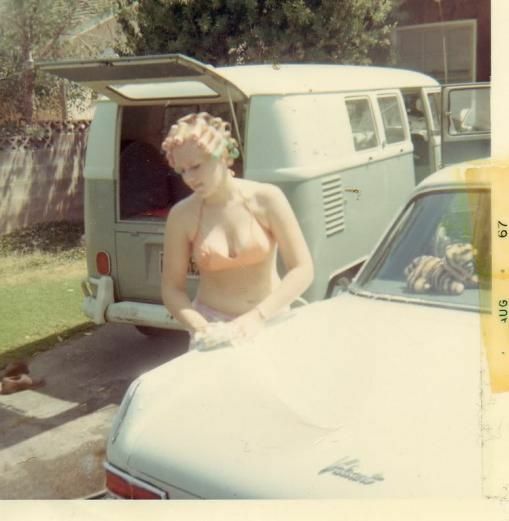 I love classic 1960s and 70s hairstyles and hairdressing, particularly classic wetsets. I collect vintage curlers, dryers and other items, and find they are much better for vintage hairdressing techniques than modern variants. You can email me at incurlers^gmail-com by replacing ^ with @ and - with a period. I was surprised at the number of reminisces about "living in curlers" I came across when doing a few of the previous posts. These commenters typically remembered setting their hair the moment they got home from work or school, and leaving their curlers in till the next day. So what's "living in curlers" like? A typical home set in the `60s was done with brush rollers, with the most typical being classic black wire brush rollers. They are often itchy as well as prickly to wear, but are more flexible than the more "modern" plastic ones. This makes them more forgiving in terms of how well the piks are pushed though them to hold them in place. The "modern" plastic brush rollers appeared from the late 60s or early 70s which I prefer to the classic wire rollers: Solo-Sleepeasy rollers and Wil-hold are the most iconic types. Solo-Sleepeasy curlers are made with softer plastic and when set with the just the right tightness are rollers you can almost forget your in curlers during the day. The only reminder that your set is when move your head suddenly and feel the tug of the curlers. Wil-hold rollers have neat rows of bristles (rather than all over like the Sleepeasy ones) and are made of slightly stiffer plastic which are perfect if, like me, your hair responds best to a tighter set. The curlers right above her forehead are Solo-Sleepeasy rollers secured with plastic piks. This is such a classic image of air drying rollers as would have been so typical in the 60s or 70s. And the mix of curlers on the sides would also have been typical . Link. 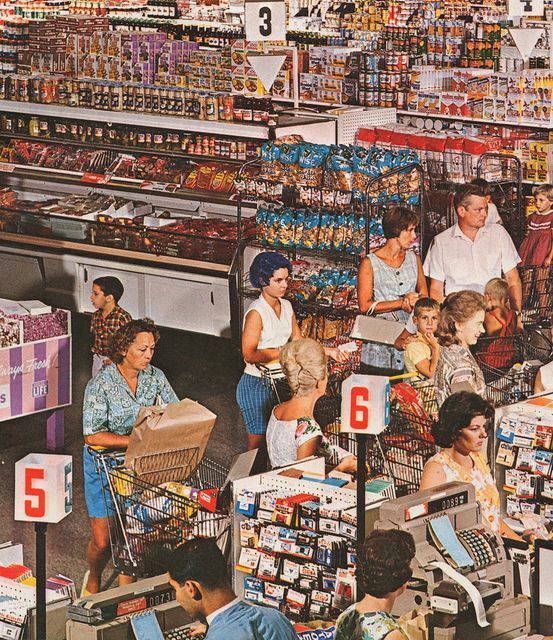 This classic image is from a vintage Wilhold package. Its what everyone in the 60s and 70s would have striven for, perfectly wound in neat rows an secured tightly with piks. These roller set so perfectly are ideal for air drying all day or all night without the risk of them loosening or falling out. 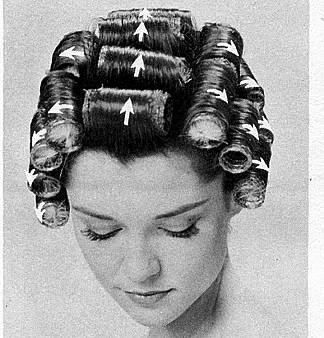 Which type of rollers was used was really just a matter of preference, but wire did come first so many women continued to use them well into the `70s even after the "new and improved" plastic rollers appeared. (Soft foam rollers also appeared in the 70s, but that was really after the daily set era). 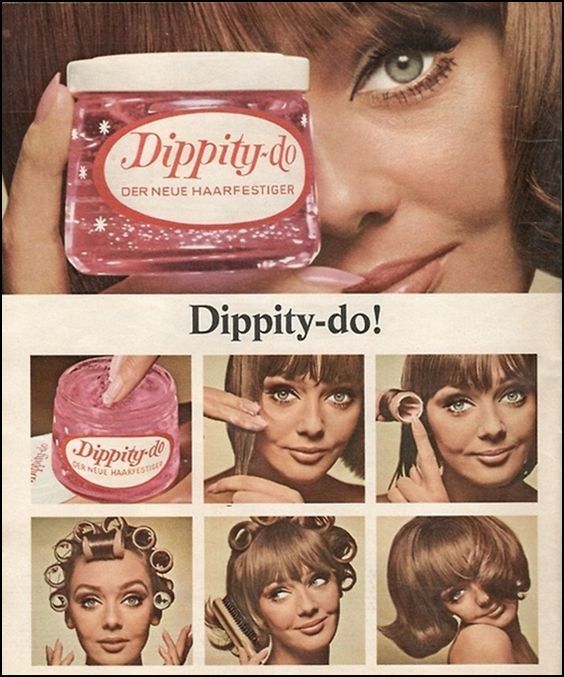 Although there were other hair gels, Dipity-Do was the most iconic one. 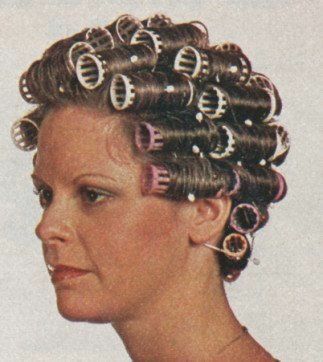 It was a unique sweet smell that you occasionally notice while wear curlers all day or night. Link. Roller sets of the 60s and 70s were usually done with sweet-smelling Dippity-Do and wound tightly with plastic piks. If you were lucky, you had someone to do it for you. The beginnings of a typical home set. The rollers are neatly wound and secured tightly with plastic pics. Link. Depending on your how your set is done, the experience of waiting for you hair to dry can range anywhere from quickly forgetting you are in curlers, to the more typical set with curlers and piks being so tight and prickly you can't forget for a second that your wearing curlers. The good thing is you do become accustomed to whatever your favorite rollers and piks are and with experience can even tell how well a set is done by how it feels. Its actually quite helpful to repeatedly adjust rollers and piks when one or another gets too tight as the hair drys, something women 60s and 70s often did. Even with the tightest sets this can greatly increase comfort and once everything is properly adjusted its actually quite satisfying knowing your curlers are in perfectly. This is such typical picture of well done home set. The setting pattern is probably the one that was most commonly used, and one pik per roller was the everyday way of securing rollers. Link. One thing that many fond reminiscences include is the smell of vintage Dippity-Do, and a really nice part of air drying is occasionally getting a whiff of that wonderful aroma. It only happens occasionally though, perhaps when some air blows though your hair or when when something brushes against your rollers. 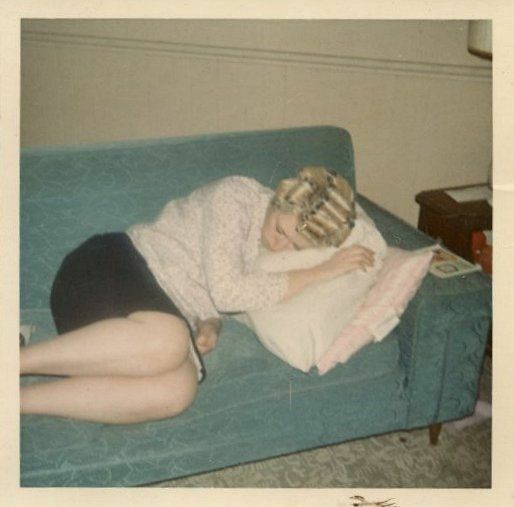 Sleeping in curlers is another matter. It takes quite a bit more getting used to, but with time it gets easier. Laying on your side is typical, with one cheek on the pillow to keep pressure off your rollers. 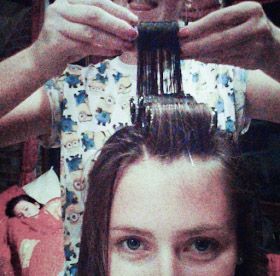 Even doing that, with your head bristling with curlers and piks, it may be hard to fall asleep. The best thing to do is think about how perfect your set is and you hopefully drift into dreamland. Unless of course (and this happens to everyone) your rollers are simply too tight and start getting painful. Its a bit like a dripping faucet in the bathroom: how long do you wait till you do something while hoping you just fall asleep. If you don't fall asleep, you eventually give in and take them out, leaving the question of what to do with you hair till morning. A big fluffy pillow makes napping in curlers much easier. Link. The only thing that's worse than too tight rollers overnight is loose ones flopping all over. There were some styles in the 70s with side-face curls that required vertical rollers at the ends of longer strands. According to one of my friends that worked in beauty salon at the time, those settings often left marks on the cheeks. I can't see how they could have slept with curlers dangling down like that. A similar problem was huge rollers. I cant see how the rollers below did not come out overnight. Sleeping in rollers was common, but sleeping in huge one like these can be a challenge, Link. The good thing is resorting to pulling out your rollers in the middle of the night happens less as you become more expert in setting them and used to wearing them. 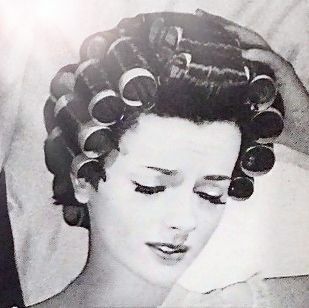 Some women in the '60s and '70s got so used to sleeping in curlers they couldn't sleep without them and when you reach that stage you know your a pro at it. I'm so used to curlers I'm lucky enough sleep better in curlers than without. A set with neatly spaced rollers is most comfortable for sleeping in. Usually though the rollers are covered with a scarf of curler cap to help keep them in overnight. Link. Curler caps were also created to cover to overnight sets and became fashionable themselves. In many cases they became a beautiful overnight accessory, often matched to a nightgown or similar. A great example of a beautiful curler cap matching her nightgown. Link. 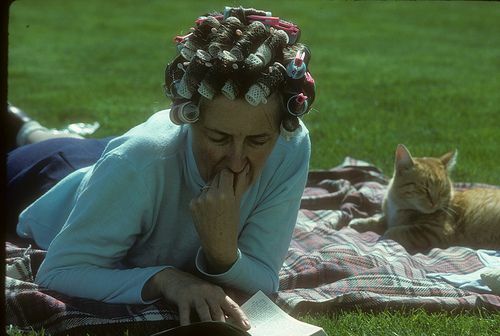 Many women really did "live in rollers" in the '60s and '70s and one way of setting slow to dry hair was simply to stay set all weekend, and some did just that. Immediately set their hair when they arrived home from work or school on Friday afternoons, and then stay set till Monday morning. As surprising as that may seem today, it actually makes a lot of sense for more reasons that you might think. It's convenient. Wash and set Friday afternoon and no need to tend to or worry about your hair all weekend. And if something does come up, you hair can be done perfectly with little notice. Nothing is more convenient that just staying in curlers. You can even wash your car. Link. With really long hair that simply didn't dry overnight, this was also the one opportunity to have a properly done set on Monday. And for that matter, it can easily take 15 or even 20 hours to dry longer hair, so unless there was a real reason not too, it made sense to just stay set. It was also fashionable in the 60s. To be seen in curlers on Saturday or any day of the week showed you were going to be doing something that evening or the next. The would have been a good reason for setting hair neatly and covering with scarf. The almost classic example of this was going to the supermarket in curlers. Shopping in curlers. Not an uncommon sight in the 1960s..Link. 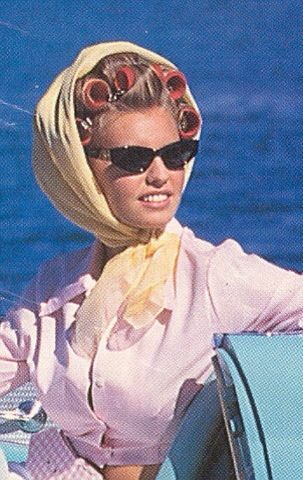 Boating in curlers. Does she look great! Link. Its more comfortable. Making more of a point of adjusting your rollers as they dry and for that matter putting them in more carefully that you might otherwise would can make a huge difference and be very worthwhile if your in rollers for the weekend. See-though scarfs were not uncommon either to protect your set and show off your handiwork at the same time. Covering curlers with a scarf was both practical and a way to show off your set. Link. Look at the combination of a smart outfit and scarf over rollers. Link. 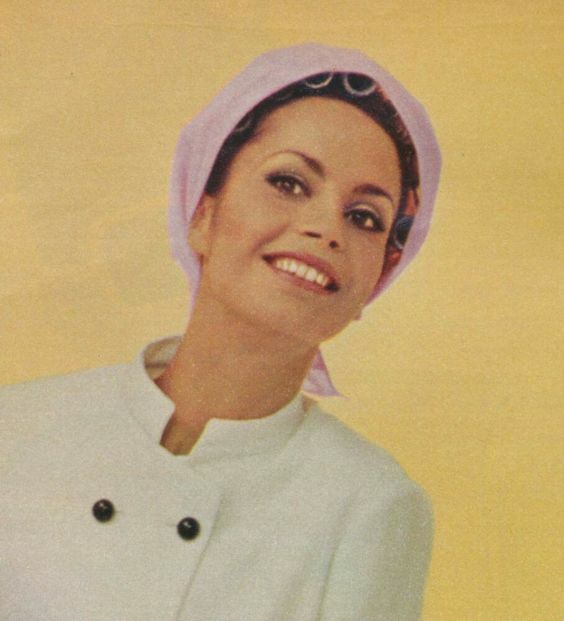 And then there was the every-day housewife look was stereotypical of the 1960s and 70s. Its sad that it was often scoffed at, considering the time and effort they took to setting the hair into some of the wonderful hairdos of the day. With the advent of inexpensive home hair dryers things changed slightly in the late 60s and 70s. 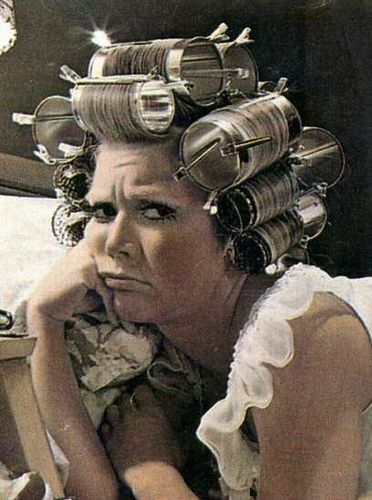 Women who had a hard time sleeping in curlers could do their hair in the morning. And those who preferred overnight sets but who's hair didn't dry by morning could partially dry before bed with a dryer. But that, and nothing since either, can fully replace the effectiveness and even practicality of living in curlers. Note: most pictures here are from Pinterest. Unfortunately, they seem to have removed the links to the original posters, so many of the links will refer to my repins. If you are the original poster and would like a proper reference or if you would like the photo removed, please email me. Pete, that was a lovely reminiscence of women "living in curlers." I'm sure I don't need to tell you that some boys did as well, including me. My mother started setting my hair after I started growing it out, when I was about 8. Typically she'd set my hair in the evening, sit me under the dryer for an hour or so, and have me sleep in them till she took them out the next day. I also had a regular weekly shampoo & set with her on Saturday mornings. If we didn't go to the salon, she'd set me on Saturday mornings and I had to wear them all day and overnight, for church on Sunday. It really didn't seem so odd at the time (1970s) -- she simply said "If you're going to have long hair like a girl's you need to take care of it like a girl." I got quite used to wearing curlers in public and, while I got a certain amount of grief, a lot of girls I knew went out in their curlers as well and they were perfectly fine with a boy in curlers. This went on till I was about 13, and I wanted straight hair (although I did continue setting my hair sometimes on hot rollers). Thank you so much for your work on incurlers! I loved this - as someone who spent many childhood nights in curlers, it's second nature to throw them in at night when I'm watching a movie (though not the hard pink plastic ones that only a kid could fall asleep in!) Sitting under a dryer still is one of my favorite things.